Naturalistic jewellery, decorated with clearly recognisable flowers or fruit, emerged with the Romantic movement in the early 19th century. It remained popular for many decades. Sentiments or meanings were often attached to particular plants. The convolvulus was thought to symbolise ‘bonds’ or ‘extinguished hopes’. 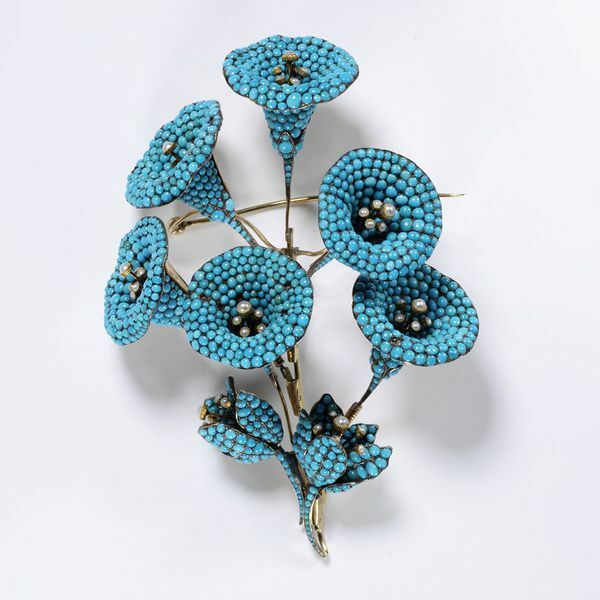 Brooch in the form of a convulvulus flower, gold, pavé-set turquoises and pearls. Brooch, 'Convulvulus', gold, turquoise & pearl, probably made in England, about 1835-50.